Canadian born poet and songwriter Dawud (David) Wharnsby began sharing his songs with audiences as a street performer in his late teens. Two decades later, his career as a troubadour has yielded a string of over fifteen solo albums, two poetry anthologies, numerous soundtrack credits, collaborations with several of the music industry’s most talented artists and performances in some of the world’s most prestigious theatres. In true folk-song tradition, Dawud’s music has spread around the world – ringing out in primary schools, universities, places of worship, rallies and conventions – with words that have found their way in to the hearts of listeners aged 2 to 92. His work and reputation as one of the most prominent spiritually and socially conscious writers of our time have been referenced in publications by both Harvard University in the USA and Cambridge University in the United Kingdom. Dawud’s writings of English language nasheed (spiritual songs drawn from Qur’anic philosophy) were among the first of their kind written and distributed professionally around the world. As a voice for the socially-conscious and spiritually-minded, Dawud’s work has inspired a generation of educators, artists, poets and musicians. Though he continues to write, record and tour internationally, in recent years Dawud has become a strong advocate of Simple Living and more actively involved with educational initiatives promoting artistic expression as a means to achieve positive social change. As a result of his global efforts in community bridge-building, Dawud Wharnsby (also an avid hiker and lover of the out-doors) was declared an Ambassador of Scouting by the UK Scout Association as of June 2010. Gaith Adhami is a poet and songwriter. He helped with the production of two albums with the internationally known nasheed band “Noor,” and continues to write songs for various artists in Arabic and English. 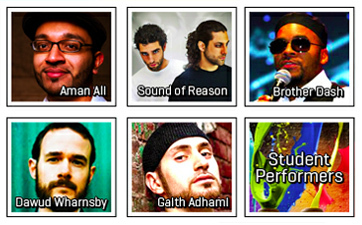 As a spoken word poet Gaith has performed at universities and events across the U.S. and Canada. His work has been featured on radio and he is currently participating in the nationwide “Poetic Vision Tour.” His album, “Upward Climb” is a blend of poetry, song, hip hop, and traditional Arabic folk music. New era. New message. New sound. In less than a year since releasing their first full length album Francis and Ku aka The Sound of Reason are quickly building up a worldwide movement with their harsh and opinionated brand of fusion music. From working with top international artists to being featured as MTV’s artist of the month The Sound of Reason are independently gaining the attention of fans across the world with one goal in mind… change the direction of the mainstream. By setting their own trends The Sound of Reason have gone from their basement studio in Montreal to top 10 on international radio all in under a year. They refuse to follow the dulled down industry standards of songs about money, white tees and bling. Instead they tackle tough issues such as faith, politics and the state of the world in general. They are The Sound of Reason, a name which reflects a meaning in music at a time where musical reason is nowhere to be heard. Their fearless attitude, infectious personalities and all out showmanship have quickly made them one of the fastest growing movements to hit the world’s underground music scene in years. Join the movement. Spread the word to everyone you can. The revolution will not be televised… if you want change let the world know. Aman Ali is an award winning storyteller in New York City and one of the only young American Muslim voices in the public spotlight today. His passionate and animated style of storytelling draws heavily from his upbringing and travels and continues to gain buzz from people all around the world. He’s made appearances on dozens of media outlets such as CNN, HBO, ABC News, and NPR to talk about his upbringing as a 20-something Muslim born and raised in America. As a reporter, he’s covered everything from Hurricane Katrina recovery efforts in New Orleans to Capitol Hill politics in Washington DC to high-profile criminal murder trials in New York to hula festivals in Hawaii. He is also recognized for being the co-creator of the social media phenomenon 30 Mosques in 30 Days, a 25,000 mile road trip he took to all 50 states in the U.S. with the mission of telling groundbreaking and profound stories about Muslims in America. He continues to share his sharp perspective about social issues as a regular commentator for CNN. Dasham K. Brookins, known as Brother Dash, was born on Dec. 3, 1971 in Brooklyn, New York. A poet, essayist, and Spoken Word artist, Brother Dash performs at many functions, both Muslim and non-Muslims. He has performed at many universities, such as Yale, Columbia, Rutgers and Drew, talking about social, political, cultural and spiritual issues in his poetry. He wrote his first poem after the tragic death of a close childhood friend when he was only 8 years old. He has a degree in English and Sociology from Rutgers University and converted to Islam in the 1990′s shortly after graduating college. Brother Dash is also the founder of the arts-based non-profit organization I Inspire, Inc., which “provides comfort, inspiration and empowerment through the arts”.